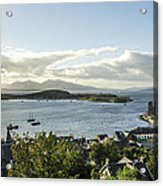 Queen duvet cover (88" x 88") featuring the image "Oban Bay View" by Chris Thaxter. Our soft microfiber duvet covers are hand sewn and include a hidden zipper for easy washing and assembly. Your selected image is printed on the top surface with a soft white surface underneath. All duvet covers are machine washable with cold water and a mild detergent. 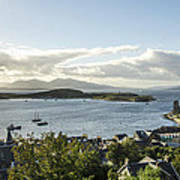 There are no comments for Oban Bay View. Click here to post the first comment. 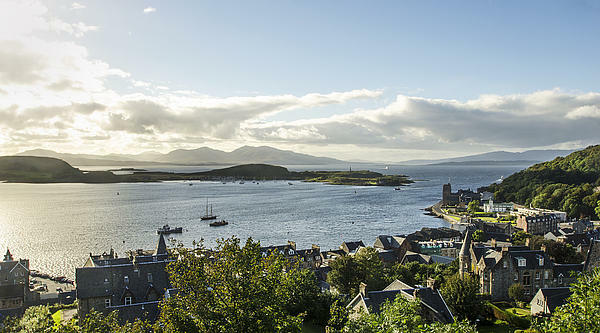 Late afternoon view of Oban Bay with views to the islands of Kerrera, Lismore and Mull. 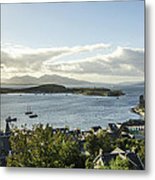 This image was taken from McCaig's Tower which is a prominent folly on the hillside (called Battery Hill) overlooking Oban in Argyll, Scotland. Oban Bay is a near perfect horseshoe bay, protected by the island of Kerrera. To the north is the mountains of Morvern and Ardgour.